Russian President Vladimir Putin, who is expected to be reelected for a fourth term in an upcoming ballot, said Saturday he had no plans to change the constitution to stay in the Kremlin beyond 2024. Asked by the US television network NBC whether he would follow in the footsteps of China's Xi Jinping, who is eyeing a limitless tenure, Putin insisted he had no such intentions. "I never changed the constitution, I did not do it to suit myself and I have no such plans to do so today," he said in an interview whose transcript was released by the Kremlin on Saturday. 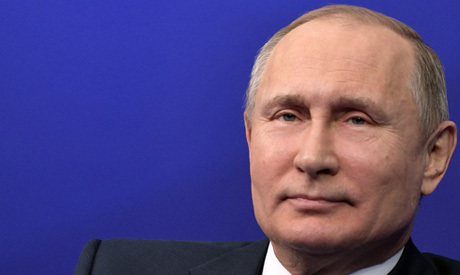 Critics accuse Putin, who was first elected president in 2000 and is running for a fourth term in March 18 polls, of harbouring ambitions to stay in power indefinitely. Putin has always prided himself on respecting the constitution, which bars him from serving more than two presidential terms in a row. In 2008, Putin became prime minister but maintained his grip on power, with his protégé Dmitry Medvedev serving as president until 2012 when Putin returned to the Kremlin in the face of huge opposition protests. He rejected suggestions that he could not quit power because it would put him in danger, saying he heard "a lot of ravings on this subject". "Why do you think after me power in Russia will be necessarily taken over by people who are ready to destroy everything that I have done over the past years?" Putin said. He said he had been thinking about his potential successor since 2000. "It never hurts to think but at the end of the day it will be the Russian people who will decide that," he added. Putin will run against a motley crew of seven challengers, with his top critic Alexei Navalny barred from contesting the poll because of a criminal conviction his supporters call punishment for challenging the strongman. Putin declined to say whether he could pardon Navalny. "Any man can be pardoned if he deserves this," said Putin. The Russian president, who never called Navalny by his name in public, referred to the 41-year-old opposition politician as "certain political forces". "What do I like in principle? It's that they expose problems and this is good, indeed it's right," Putin said. "But it's not enough for the country's positive development. Absolutely not enough. Because concentrating one's attention on problems, it's not only insufficient, it's even dangerous because it could lead to certain destruction and we need creation."